Those confirmed individuals that proclaim the Word of God at Mass who have a deep love for the scriptures. Those Catholics in good standing who wish to assist in the feeding of the community at Mass with the precious Blood and Body of our Lord. People who enjoy singing, playing an instrument or being part of joyful dynamic support that supports the celebration of the Mass. All are welcome whenever you have the time to join us: weekly, monthly, seasonally, or whenever you can. For those who have made their first Communion and wish to assist the ministers at the altar in the celebration of the mass. Those that assist in the set-up and take down in our liturgical celebrations, namely the mass. Those that take care of the linens used at our liturgies, and helps keep the sanctuary clean. Those that welcome people at the doors before mass each weekend so that no one is a stranger. They also distribute the mass bulletin. For men and women in high school or older who assist people in getting seated. Responsible for taking up the collection, and securely placing the donations into the safe. 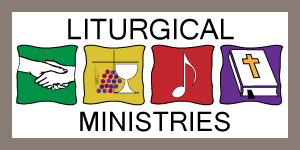 Invites people with artistic sensibility and/or experience to become part of a committee to oversee the “decorating ” of our church building during the different seasons of the year and coordinates the floral arrangements at our liturgies.